So I'm basically blown away by all of your comments on the last post. And I'd love for you to continue to comment if you haven't. I can't get over the diversity. I was looking over each one last night and the statistics nerd in me couldn't help but kind of tally some things. You represent only about 5-10% of all those who read here but I imagine you are a good representation overall. Only 1/3 of you are from the south and there are a good portion of you from outside the U.S. You are anywhere from 18 - 70. Probably 33% - 50% of you are Christian. But there is a BIG portion of you who are out of religion or the church or are agnostic/athiest. You are in all stages of lives. The one thing - you almost all share the same fears and desires. Anxiety/worry and comparison are your biggest struggles and losing the ones you love is the biggest fear. We are all so different and yet we are also so much alike. In ways you probably don't realize. We all want to feel loved and we all want to feel like our lives matter. And I'm praying for each of you. You may think we have absolutely NOTHING in common but I hope you know I still care about you! I really do. And you may not believe in my Jesus and may even think my faith is crazy and hokey - but I still pray for you. And I'm glad you visit me here. Yesterday was Cowgirl/boy day at Preschool. Harper was SOOOO excited. She got to wear her cowboy boots. She had such a fun day. She is loving preschool so much this year and has been learning so much. She comes home every day knowing new things. I'm so proud of how far she has come. Her speech therapist told me this week that she is SO impressed with how well her speech has progressed. She encouraged me that she is going to do great at school next year. This time last year I was a worried mess so this is a HUGE answer to prayer. A few of us who have kids in school on Wednesday talked about driving about 30 min away to eat at our favorite Mennonite restaurant. So we went yesterday. The food is good but you go for the desserts. And we weren't disappointed. If you live in NWA - you need to visit the Wooden Spoon in Gentry. 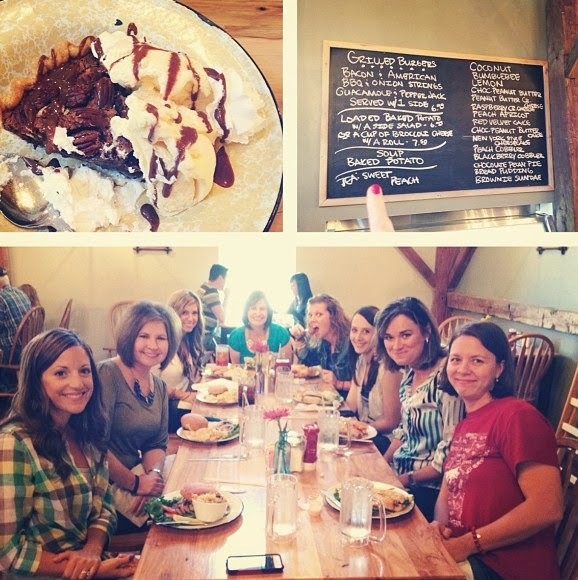 The chocolate pecan pie is a ministry.